please see *** for more on this photo. FIRST: A note about the featured image. Please see *** below. NOW on to the glossary. I realize the language and terminology in ShadowLight is foreign and since the language is often based on more than Old Norse (drawing from myths, other languages, or simply made up), I’ve started a glossary of terms for those of you looking for more information on word translations. I’m sure I’ve missed some (or more than some), so please feel free to comment or contact me at mande@mandematthews.com if you’re unclear on any meaning; or if you want to know more about a specific word or phrase. algiz rune meaning protection, a shield, speak the rune to ward off evil, to call forth sanctuary. aram coppers Scandian: money that has come from the far south/east on trading ships. caller Alven: one with the ability to speak with creatures. Also called dyra-sogn. dyra-sogn Alven: one with the ability to speak with creatures. Also called a caller. Translation: beast song. dyrr Alven: translation – doorway. A gold medallion which helps the bearer to travel between worlds. It’s a combination of magic between a songvari and a master shadowwalker. Eikthrynir Alven mythology: the first deer born to the Mother and Guardian. Where he walked, rivers were formed. He helped in the creation of the world. Frey’s Festival Scandian culture: a scandian holiday where they gather honor the god Frey and their bounty. galdr Scandian: spellwork achieved by chanting the names of runes. Galdr is rune-magic and is the Scandian weaker version of an Alven Songvari. Guardian Tree Both Scandian and Alven though they differ in the precise meaning. Generally a mythical (or godlike) being thought to create the worlds along with the Mother. Male counterpart. hagalaz rune meaning a hard master telling of loss before gain. The rune works in reverse. Halls of Valhalla In Scandian myth, this is a place for dead warriors that is ruled by the god Odin. lurk-abouts Scandian lore of magical creatures. In truth this refers to either shadowwalkers or dwarves. Odin Scandian: god of war and magic – king of gods. Also the king of Upsalla. Odin’s tree Scandian myth: A tree from Scandian myth where the god Odin hung to gain knowledge and the power of magic and runes. sal drengrs Scandian: soul warriors – those destined to fight side by side for life. Translation: drengmaer is the female version of this word. scald A Scandian storyteller, singer, poet. The Norse equivelent of a bard. shadow things Scandian lore of magical creatures. In truth this refers to either shadowwalkers or dwarves. shadow-spawn Both Scandian and Alven – evil creatures that are believed to be Loki’s brethren. spiritwalk Scandian: same as Shadowwalking, but used by the Women of the Way. valkyrie Scandian: a mythical creature that can take the guise of a swan or warrior woman and is a servant of the Goddess Freyja. * A NOTE on the Mythology contained in ShadowLight. ShadowLight uses Norse mythology as a jumping point for the land of Scandia. However, many myths contained in ShadowLight are twisted or fictional renderings, using Norse myths as inspiration only. My intention was to create a first level world (in this case Scandia as it’s the first world we enter as a reader) which was populated by different peoples with similar myths and legends, albeit with different viewpoints. Then we would enter a parallel world and see the similarity to the first world beliefs but discover they were altogether different, begging the question of what we think we know might be entirely wrong. In book three we’ll discover even these beliefs, which seem to be true, are often not. The original sentence that popped into my head one day, “Between darkness and light, there is truth,” speaks to this theme that runs throughout the entire series. What is truth? Dark and light? Right or wrong? Is it only a perspective or is there a deeper truth that permeates all? **A NOTE on runes. Runes appear in both Scandia and Alvenheim, and are both based on the old tongue in Alven. However, most of the language is lost to Scandia and only simple runes remain. These are symbols that represent words and concepts. In Alvenheim, the old language is much richer and exists along with the common tongue. Though the old tongue is a complex system written with runic symbols, they are also spoken within the language. ***A NOTE on the featured image. This particular artwork caught my eye—he reminds me of how I picture Erik, although Erik’s eyes are green. I am a fantasy art fanatic and love sharing beautiful works with others. This specific image I found through a free wallpaper site with no attribution for the artist. If you know the artist or are the artist please contact me; I’d love to attribute your work to you! It would appear from the search I’ve just taken using windows 10’s Cortana that the picture is ‘the song of ice and fire, game of thrones, jon snow’. Ah. So it’s fan art for Game of Thrones, and that would make sense. Still unsure of the artist. Thank you for doing that search, Vorrn. Much appreciated! 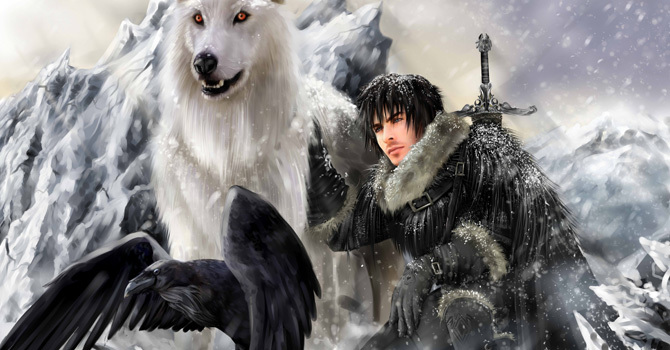 I assumed the artist was jon snow, or is he a character from GOT? Jon Snow is a character from GOT. He’s played by the brilliant actor Kit Harrington on the HBO series, though the artwork looks more inspired by the books rather than the HBO series.